of land, most of which are cultivable. From Summer 2014 it's provided with a swimmingpool. It takes its name from the Latin God (Janus Bifrons) that refers also to the name of the place where the Agriturismo stands: “Montegiano” (literally The Mountain of Janus), hamlet of Mombaroccio. of the typical products of the area. Just a mile away from the Agriturismo, lies the Beato Sante Oasis, with its monastery tucked amid greenery, in a forest with several hiking trails. 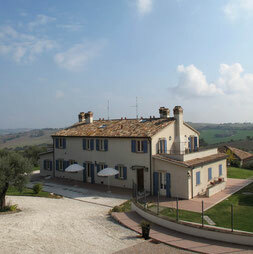 Furthermore, the Carignano Thermal baths are just 5 miles away. and cultural sites in the area such as Gradara (18 miles) and most of all Urbino (at just 20 miles).